Disposable bags have become a huge problem everywhere in the world. Up to a trillion bags are consumed worldwide each year. That comes out to over a million per minute. Billions end up as litter. Americans use over 380 billion polyethylene plastic bags per year, which cost retailers about $4 billion annually. That works out to over 500 plastic bags consumed per person in the U.S.A. Canada is about the same. The making of plastic bags uses an estimated 12 million gallons of oil which could be used for fuel and heating and which contributes to air pollution and energy consumption. Less than 2% of the plastic bags in the U.S.A. are recycled. When thrown away plastic bags may take up at 1000 years to break down. As polyethylene breaks down, toxic substances contaminate our water, leach into the soil and enter the food chain. 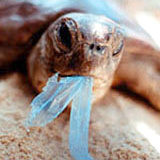 Approximately 1 billion seabirds and mammals die per year by ingesting plastic bags. Hundreds of thousands of whales, dolphics, sea turtles and other marine mammals die every year after eating discarded plastic bags they mistake for food. These animals suffer a painful death. The plastic wraps around their intestines or they choke to death. Plastic bags are among the 12 items of debris most often found in coastal clean-ups. Plastic bags choke landfills, and are carried into the wind by forests, ponds, rivers and lakes. According to various estimates, Taiwan consumes 20 billion plastic bags annually (900 per person) and Japan consumes 300 billion bags each year (300 per person) and Australia consumes 6.9 billion bags annually (326 per person). About 2.5 billion bags are used in Singapore every year. That's about 2,500 per family per year. If each person uses one less plastic bag, Singapore could save more than 50 million bags per year. Discarded plastic bags have become so common in Africa they have spawned a cottage industry. People there collect the bags and use them to weave hats, bags and other goods. Plastic bags in Antartica have become commonplace where they have gone from being rare in the late 1980's and early 1990's to being almost everywhere. As part of Clean Up Australia, in only one day almost 500,000 plastic bags were collected. In New York City alone, one less grocery bag per person per year would reduce waste by 5 million pounds and save $250,000 in disposal costs. Plastic bags are considered to be a "free" commodity, but the cost to households of $10 to $15 per year is added to the price of the goods that they purchase. Plastic does not biodegrade. It is bio inert. It is embrittled by the sun. The Great Pacific Garbage Patch (North Pacific Ocean Gyre) is a swirling mass of small plastic debris twice the size of Texas and weighing about 300 million pounds. It is composed of entire plastic items (toothbrushes, pens, soothers) and plastic that has broken into smaller pieces that don't decompose. 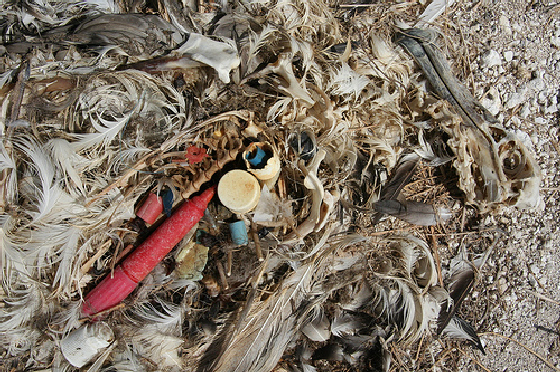 In the surface of the Pacific Ocean, plastic outweighs plankton. 27% percent of the total of the total of what is found in the North Pacific Ocean Gyre is plastic film like that used in packaging. There is no code for knowing what kind of plastic there is. There is no infastructure for recycling it. It's an irony that a product that is meant to last forever, is used for seconds and then tossed. The Great Pacific Garbage Patch Good Morning America 4 min. Charles Moore: Sailing the Great Pacific Garbage Patch Ted Talks 7 min. The World's Biggest Garbage Dump 7 min. Plastic Soup for the Soul Plomomedia 3 min. The Majestic Plastic Bag: A Mockumentary 4 min. 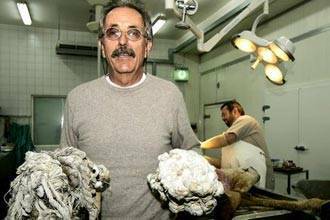 Rocks of calcified plastic bags found in camel stomachs. Other animals are now impacted. The Emirates News Agency reported that the decomposed remains of camels in the desert region of Falaj Mualla, first discovered as early as 1997, revealed that 50% of the camels died from swallowing and choking on plastic bags. And while the camels had decomposed, their plastic bellies had not, according to the Ministry of Environment and Water. “Rocks of calcified plastic weighing up to 60 kilograms are found in camel stomachs every day,” said Urlrich Wernery, whose clinic conducts hundreds of post-mortems on camels, gazelles, sheep and cows in the UAE to Al Arabiya. He adds that one in two camels die from plastic. Garbage in general has become a huge global problem.